Would you like to be confident enough to finally put yourself out there and do your thing no matter what people say? Are you ready to diss those fears and focus on dreams instead? YOUR BELIEFS DON’T DEFINE YOU. They are just other people’s version of what you should be and their truth, their perspective. YOU ARE AMAZING, UNIQUE AND BEAUTIFUL AS YOU ARE. It’s time to let the world see your true self. Being authentically YOU is so liberating!!! Imagine doing exactly what you want to be doing, without any fears and confidently. WHEN YOU BELIEVE IN YOURSELF ANYTHING IS POSSIBLE!!! I have helped women start their businesses, quit their jobs, get promotions and conditions under their own terms, find jobs, move to Bali, get on stage and speak or even sing in front of people…basically – go for their wildest dreams!!! I BELIEVE IN YOU UNTIL YOU START BELIEVING IN YOURSELF. I get it, it’s scary to put yourself out there and step out of your comfort zone. I personally couldn’t even speak in front of people, let alone do something. I have been facing my fears over and over again until I cleared it. I did so much healing around it so I could do the things I wanted to do. Life is too short to do things you don’t feel passionate about. Let your WHY was stronger than your Fears! I’ve been working with lots of clients from all over the world and I have now created a program that will help you feel confident. I use several modalities to help you reprogram your mindset to feel confident and fearless! These modalities have in my opinion worked the best and in combination with the confidence toolkit you will receive to accompany our work together. 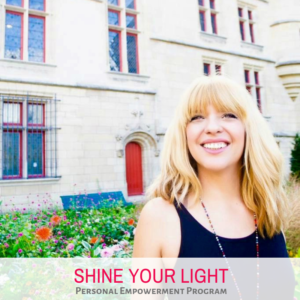 “Shine your light” is personal empowerment program designed to help you break free from your own personal limitations and feel confident to pursue your goals and manifest your desired reality. All sessions are 60 minutes long (apart from the consultation), held via Zoom and you get the recordings of our sessions for future reference and practice. READY TO SHINE YOUR LIGHT?